We want your feedback! Please let us know what you think about TFS. Do you have an interesting story or article that you would like to share? If so, please let us know! The Civilian Marksmanship Program is dedicated to the respect for and safe handling of firearms, instilling patriotism and discipline in our youth participants. The CMP provides its constituents with the highest level of instruction in the proper control of firearms by highly-skilled coaches and veteran range safety officers in the classroom, at our ranges and wherever the CMP banner is displayed. Photos may be downloaded or ordered on our website at http://cmp1.zenfolio.com/. Elizabeth Bark started shooting in September of 2010, starting with smallbore. When she started with air rifle in October 2010, she was hooked on competitive shooting. Once she became involved in competitive shooting, she made her first goals: 1) To make the Maryland State Sporter Team for CMP, JO and NRA National Championships for 2012 before she turned 14, and 2) To earn her NRA and CMP Distinguished Expert Award/Medals before she turned 15 in 2013. Elizabeth earned a position on the Maryland State Sporter Team in 2012 before her 14th birthday. She was the youngest member of the team and finished second on the team after the tournaments. The following year, she earned NRA and CMP Distinguished Expert Award/Medals before her 15th birthday. She did this by increasing her practices up to four times a week and entering every tournament that her coaches could find. Elizabeth also received the Maryland State Rifle and Pistol Association Top Gun award for sporter class in 2013. For the 2013-2014 season, Elizabeth moved to precision class with the same determination that she had in sporter class. She has exceeded what would be expected from any junior shooter. She has learned how to evaluate what she is doing and how to make refinements to her shooting skills. 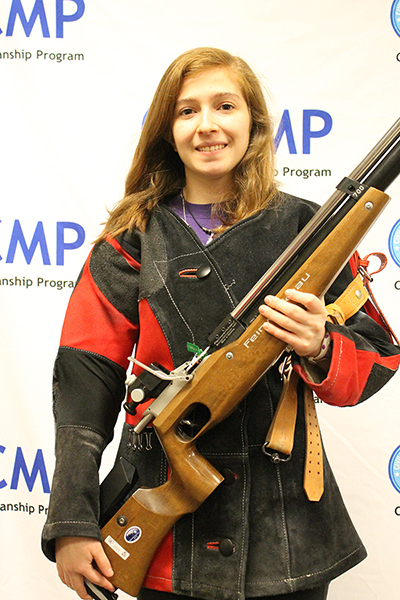 In 2014, Elizabeth made the Maryland State Team for NRA Nationals and also qualified for the CMP and JO Nationals that were held at Camp Perry. She shot in all three national championships. Now, in the beginning of the 2014-2015 season, Liz has offered to help get a teammate started in precision class. Liz is also helping a new coach understand the commitment it takes at every practice to be a winner. Elizabeth practices between 3-4 times a week and has also been helping to teach other team members. She recently attended the West Virginia University Rifle camp to further enhance her skills. Elizabeth balances her schoolwork with her shooting schedule. She is working to earn both academic and athletic shooting scholarships at the college level. Her ultimate goal is to be a member of and win at the Olympics.